Published 3 days ago. About a 5 minute read. Throughout the world, 1.1 billion people are still living without power. The majority of these people live in developing countries, in villages that have no sources of light, aside from natural light. According to official data, only 7.3 percent of India’s villages have complete household connectivity, and the World Bank reports that over 300 million Indians are still living in the dark, even though 200 million of them are from villages that are thought to have electricity. Once the sun goes down, these people cannot work or learn — making personal and economic growth exceedingly difficult. Furthermore, many homes use kerosene lamps, which produce high levels of air pollution. This affects the health of hundreds of millions, with women being particularly at risk as they suffer from smoke inhalation from cooking. A number of entrepreneurs, nonprofits and large companies alike have worked to address this problem with non-polluting technologies for cooking and clean lighting solutions, both on-grid and off-grid, but the problem still persists. That’s why, in 2016, law firm Hogan Lovells launched a three-year partnership with Barefoot College International — a social enterprise working in nearly 100 countries — to empower mostly illiterate women around the world by training them as solar engineers, or “Solar Mamas.” The initiative aims to bring clean, renewable light to 20,000 families (200,000 people) in rural villages across Asia, Africa, Latin America and the Pacific Islands. Once the Solar Mamas have learned to build, install, and maintain solar panels and batteries in their communities, they also have the opportunity to learn entrepreneurial skills. For example, many women use their sewing skills to launch a craft business, while others learn to make and sell coffee. As a result, the Solar Mamas program opens doors for other possibilities that can dramatically enhance the lives of women, their families, and their communities. 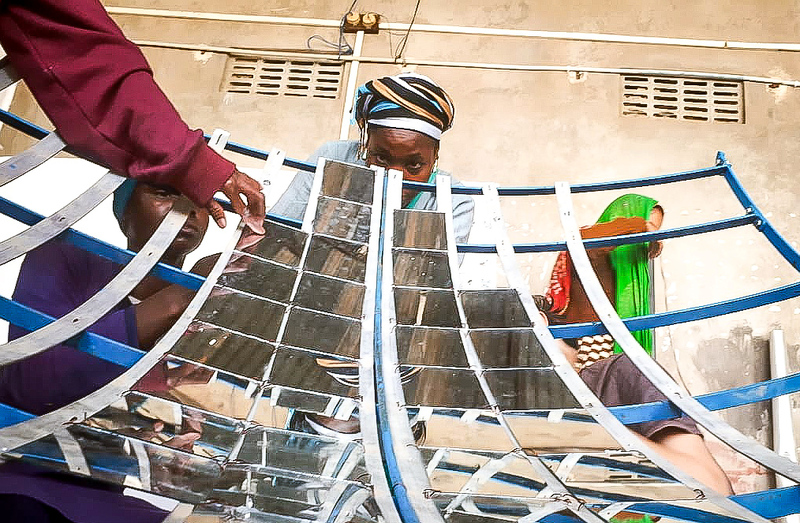 Barefoot College’s Solar Cooker Department has also been working to teach the Mamas how to disassemble, assemble and use Parabolic Solar Cookers — a great alternative to traditional wood or kerosene-burning fires that many of the women use in their countries. The components and tools required for constructing the Cookers can be more or less available and affordable. In addition, the Cooker itself was fashioned to be easily replicable; upon return to their respective countries, Mamas should have little issue in helping their communities create the cookers, so long as a metal shop is available to support them. According to the World Bank, women who work invest 90 percent of their earnings back into their families and communities, whereas men only invest 35 percent. This money is usually spent on food, healthcare, home renovations, and education for themselves and their children. A 2015 report by McKinsey Global Institute found that advancing women’s equality could contribute up to $12 trillion to global annual GDP by 2025. So, if businesses and organizations invest in girls and women, not only can it help stimulate economic progress but it can also grow markets and enhance people’s health and education. To date, Hogan Lovells has helped Barefoot College achieve a number of goals, including enabling and supporting the training over 384 Solar Mamas from 35 countries. The firm has also raised $400,000 globally in donations from its employees, and it’s provided more than 1,300 hours of pro bono advice to open four new solar training centers in Africa and educate Solar Mamas on human rights. Furthermore, Hogan Lovells is helping Barefoot College to educate schoolchildren about Barefoot and the SDGs, with over 1,000 schoolchildren in 12 countries reached to date and 83 percent of students stating that they would like to work on developing new solutions to global problems. On Tuesday, April 30, Hogan Lovells and Barefoot College will partner with **Impact New York** to feature Flip the Switch, a 30-minute documentary, at IPIC New York City. The film follows the journey of the Solar Mamas and explores the importance of shared-value partnerships in achieving the SDGs. Flip the Switch has received critical acclaim and to date has been awarded official selection status at ten international film festivals. Click here for more information on the New York City premiere.